I’ve got to be honest – I am not a pot lover. Admittedly the moment in Ghost gets me but if I was Demi, I’d prefer to be standing over bacon sizzling than a casual bit of pottery. However…. Grayson Perry is a different matter. He is just brilliant, so on hearing about ‘The Tomb of the Unknown Craftsman’ I got myself down to the British Museum sharpish. On entering the show the first thing you clap eyes on is a kitsch, pink motor bike with Grayson’s teddy Alan on top, who travels everywhere with him, through both his life and his work. Immediately the message given is ‘Hey, wanna jump on my bike and check out my exhibition, my teddy bear is going to drive, is that cool?’ Such an opening relaxes the visitor- hard to achieve in a museum. 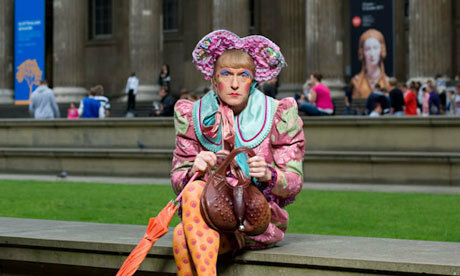 Grayson Perry masters the conveyance of challenging themes without pretension or threatening the spectator. The flaws he finds with society are adressed through classical ceramics with a beautiful subtlety, which I believe a great deal of contemporary art lacks. One pot comments on Africa, titled ‘I have never been to Africa’ – the ills it illustrates are based on his removed conception of the continent. This honesty and naivety is all the more endearing..
Grayson does not feel superior as an artist, the way he projects himself is testament to this – Transvestism over dark rimmed glasses! It doesn’t feel like he is trying to teach us anything, he just wants to show off his amazingly crafted ceramics and chat about how fucked up everything is. Oh, and a beer for Alan!